On September 1, 2013, The Sagebrush Habitat Conservation Fund completed the permanent retirement from livestock grazing of over 130,000 acres of public land in the former 45 and Tent Creek grazing allotments in Owyhee County, Idaho. This permanently closes over 200 square miles of public lands to livestock grazing, ensuring habitat improvements for sage-grouse, California bighorn sheep, redband trout, and antelope. 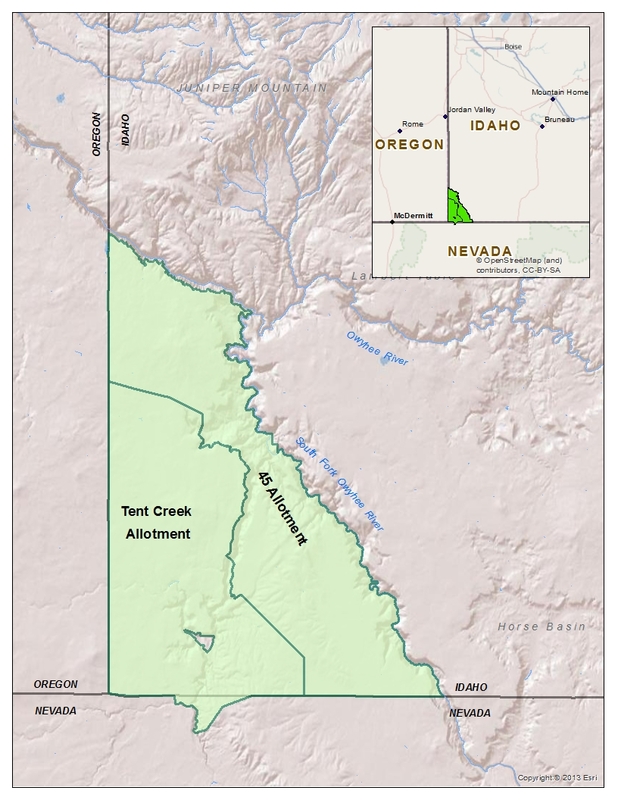 The allotments also encompass a vast sweep of relatively healthy sage-steppe landscapes including spectacular rhyolite canyon scenery of a number of tributaries of the Owyhee River and large areas of designated Wilderness adjacent to the Wild and Scenic South Fork of the Owyhee River. The permanent retirement of these two allotments from livestock grazing is the result of an agreement between the Sagebrush Habitat Conservation Fund and the two permittees who formerly held the BLM grazing permits. Sagebrush Habitat Conservation Fund is itself the result of Western Watersheds Project’s agreement with the El Paso Corporation (now Kinder-Morgan), a large natural gas transmissioin company, to form the Fund in June 2010. In exchange for Western Watersheds Project not filing legal challenges to the 670-mile Ruby pipeline, El Paso Corp. agreed to provide $15 million over ten years to the Sagebrush Habitat Conservation Fund to be used for voluntary and permanent Retirements of public land grazing permits. Since grazing permit relinquishment does not necessarily lead to permanent retirement of livestock grazing, The Sagebrush Habitat Conservation Fund seeks to carry out its work in locations where the legal framework authorizes permanent retirement of livestock grazing. 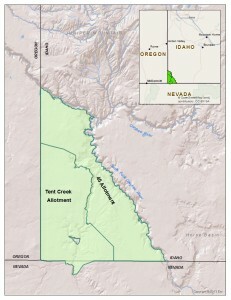 In the case of the 45 and Tent Creek allotments, it is authorized by a provision in the Owyhee Wilderness Act of 2009 sponsored and passed through Congress by Idaho Senator Mike Crapo as part of the Omnibus Spending Act of February 2009. The 2009 Owyhee Wilderness Act authorizes the permanent retirement of voluntarily relinquished grazing permits located wholly or partially within designated Wilderness. Both the 45 and Tent Creek allotments meet that requirement and have been retired forever by the BLM. This major conservation accomplishment by Western Watersheds Project and the Sagebrush Habitat Conservation Fund with the welcome agreement of the 45 and Star Valley Ranch owners is the start of many more landscape-scale retirements from livestock grazing across the sagebrush sea. The fact that this is a permanent retirement is definitely a positive step. 130,000 acres sounds huge until it gets converted to square miles, which it was. Then see how large that would be in a square. A tad over 14 miles on a side; more than five and a half townships of 6 by 6 miles. That is progress! Thanks WWP and Sagebrush Habitat Conservation Fund. Thank goodness for this land and the native wildlife that will have some peace. How did they calculate the value of those grazing allotments? Several years ago I calculated one allotment in the Sand Wash Basin, at the private land grazing rate over a ten year period, at a million dollars. That seemed like a pretty good offer until I learned that all the permittees who run livestock in the SWB are already millionaires. Every little bit helps, the average American is always surprised and disappointed know there are cattle on public lands, even in some National Parks. These cattle are only a couple of percent of the beef sold in America each year but they exact a huge toll on wildlife habitat. I added WWP to my annual contribution list last year, even though I don’t reside in the Northern Rockies. Do you get tired of mailing contributions with the most visible result being to spur the volume of paper in your mailbox from the same sources soliciting further contributions for various “urgent campaigns”, sometimes offering bags or gadgets like cheap binoculars that you don’t need? Does it make you wonder where your money is going? Hasn’t happened with WWP — and if you tune in here occasionally you get to see and appreciate where it’s going. Thanks to your common sense suggestion, I am connecting with Western Watersheds Project today to add them to my donate to list. And it will be a generous donation. Please all, start donating to the groups who are actually getting real things done for land and wildlife. Let’s hope this is a tipping point. It will be fascinating and beautiful to watch this land recover. It would be interesting to hear some success stories of how the permittees fared in this arrangement. It was voluntary, they are probably better off, and other ranchers might have to think twice about where they stand on the current use it or lose it BLM grazing permit policies. Finally, the retirement of grazing allotments! Hard to believe. Too bad there are no wild horses or burros to received the good news.